This stunning Wedding/Anniversary ring is ablaze with 178 hand-picked round Diamonds tension and pave set in rows, these solitaire Diamonds radiate and rise over to meet with the polished 14-Karat white gold shank. This ring comes complete with an inner basket weave for added beauty and comfort that maximizes the fire and brilliance of 2.42 Carat t.w. 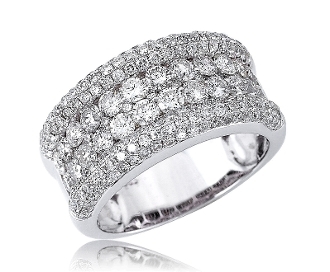 in Diamonds; while, creating security and long lasting wear. For added appeal personalize your item, select our Engrave option and indicate size needed when adding to Cart.